Self-appointed Guardian of the rights and welfare of world's two billion children and generations yet-t0-be-born. Organizing 32 international events regularly to promote world unity and world peace. Drawing inspiration from Victor Hugo who said "There is one thing stronger than all the armies of the world and that is 'An Idea' whose time has come" Dr Gandhi came up with the thought that “Enforceable International Law and Empowering the International Court of Justice is 'The Idea' whose time has come" in order to safeguard the future of the world's two billion children and generations yet-to-be-born. He upholds that empowering the International Court of Justice is imperative to decide disputes legally and without violence and for interpretation of international law. This will obviate the need for violent conflict because international disputes would be resolved peacefully and legally by the impartial court, and large resources spent on defense and defense-preparedness can be utilized for the welfare of humanity. In the present situation this can be done by empowering the International Court of Justice and by strengthening the United Nations system and removing the veto power system. Dr Gandhi, the founder of CMS, Guinness World record holder the largest city school in the world, views himself as a self-appointed guardian of the rights and welfare of world's two billion children and of generations yet-to-be-born, therefore Dr Gandhi has been striving relentlessly to persuade the world's political leaders and heads of national judiciaries to take up the children's cause and to ensure that their right to inherit a safe and healthy future is protected. 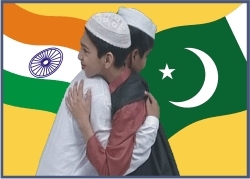 In 2002, Dr Gandhi conceived and implemented the idea of Indo-Pak Children's Friendship Club. Named "Aao Dosti Karein" (come, let us be friends), the ADK Club facilitated letter exchanges between thousands of CMS students with their Pakistani counterparts and later led to exchange of visits between CMS students and students from many Pakistani schools. The objective of ADK Club is to promote and infuse in their hearts and minds the idea of unity & peace between India and Pakistan and implant the idea of world unity and world peace in the children of both the countries. Dr Gandhi conceived the idea of holding sessions of 'Children's World Parliament' where children playact as world leaders and discuss global problems and solutions preparing them right from childhood to be responsible world's statesmen. The idea is to let the children imagine themselves as the citizens of the world, addressing humanity as one family. 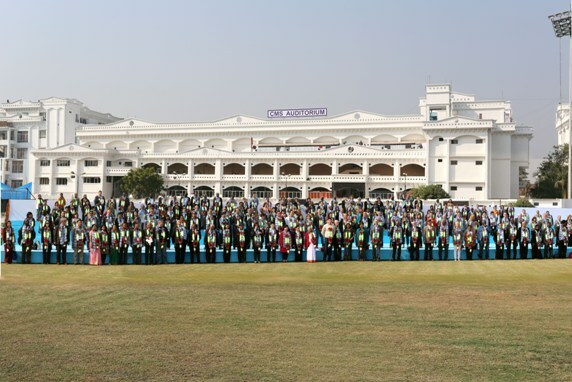 At CMS, the World Parliament Session is an integral part of every school event. Thus every year nearly one hundred World Parliament Session are held in which our 10,000 students participate. Dr Gandhi popularized the concept of 'World Citizen's Dress' which was first developed by Professor Mangesh Teli of Bombay University. Embossed on the World Citizen's Dress are the symbols of all major religions and the national flags of all countries. The dress is the central focus of the spectacular World Peace Prayer Ceremony that is an integral part of every CMS event. The entire presentation aims to inspire young children to view themselves as World Citizens responsible for the welfare for all beings in the world. The World Citizen's Dress is a symbolic synthesis of the cultural diversity of human beings. It is white in colour, which is a universal colour for peace and purity. The Dress has the holy symbols of all major religions of the world around the neckline. 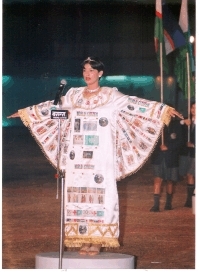 The flags of all the member countries of the United Nations are also embossed on the Dress, representing the international community and symbolizing the brotherhood of mankind. The Dress is used in the World Peace Prayer Ceremony (WPPC) which forms an integral part of all CMS functions, to make children realize that we are all members of one global family. The national flags of all the countries are also used in the WPPC when peace prayers are rendered for each country individually by name, by the participating students each representing a difference country. A separate "World Unity Education Department" (WUED) has been established. This department is working to promote world unity through manifold activities. It is also responsible for organizing the International Conference of Chief Justices of the World, the Sunday Seminars as well as the Indo-Pak Children's Friendships Club among others. Peace Poles are also a project of the World Peace Prayer Society (WPPS) and more than 200,000 such monuments to peace have been planted in 160 countries across the globe, under the aegis of the WPPS. Erected with the objective of inspiring thoughts of peace and unity, Peace Poles are obelisks inscribed with the prayer "May Peace Prevail on Earth", on all four sides. 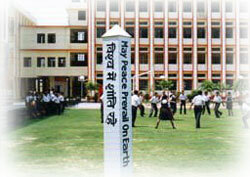 More than half a dozen Peace Poles dot various CMS Branch campuses in different parts of the city of Lucknow. Many people have compared Peace Poles to acupuncture pins on the acupressure points of the globe. Some of these Peace Poles have been planted by eminent personalities like the His Holiness The Dalai Lama, Mother Teresa and the Pope. Peace Poles have been planted at Aliganj, Chowk, Gomti Nagar, Kanpur Road and Station Road Branches of CMS. They were planted by prominent personalities of India with much public awareness built around each planting. Every Sunday, a World Peace Satsang (denominational religious gathering) is held at CMS Gomti Nagar Branch in the morning and at CMS Station Road Branch in the evening where spiritual heads and religious leaders address people on the need for world peace and how to work for realizing the same. Some of the most famous names in India have addressed the public from the CMS portals. These include Sri Sri Ravishankar and Dada Vaswani among others. Eminent intellectuals and social workers also address the World Peace Satsangs often while well known musicians and singers regularly sing peace songs and devotional hymns at these gatherings. These World Peace Satsangs are very well attended and regularly covered by the media. CMS peace floats and marches are a regular feature of the annual Republic Day Parade in January each year which is watched avidly and appreciated by millions of viewers in the city and state wide on Tele Vision. 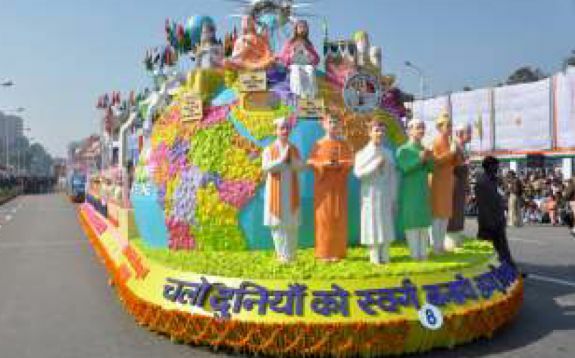 CMS floats are always based on the theme of world unity and world peace. They have won the Governor Trophy and the Best Float Award a record number of times during the last 28 years. CMS students and teachers often carry out marches to raise awareness of various issues of local, regional or international importance.